So many of you might not know this about me, but I am Spanish. Both my parents were both born and raised in Spain and moved here in their twenties. They are both very Spanish and made sure that even though their kids were raised in America they had their Spanish traditions installed. Every summer since I was born we would go back to Madrid, where they are from and just spend the summers there with family and I really see Madrid as my second home! I love Texas, but Spain will always be my second home to me. When through out the year when we weren't in Spain my mom wanted to make sure we were still eating Spanish foods. Every Saturday she would make us Churros con Chocolate! Now these are the real deal y'all, not the kind of Churros you get at sporting events, but the real stuff you will find in Spain! Its so easy and SO amazing! I seriously am obsessed with them, and when I have kids I will for sure be having Churros Saturdays. 2. Then add the boiling water and work together into a paste. 3. 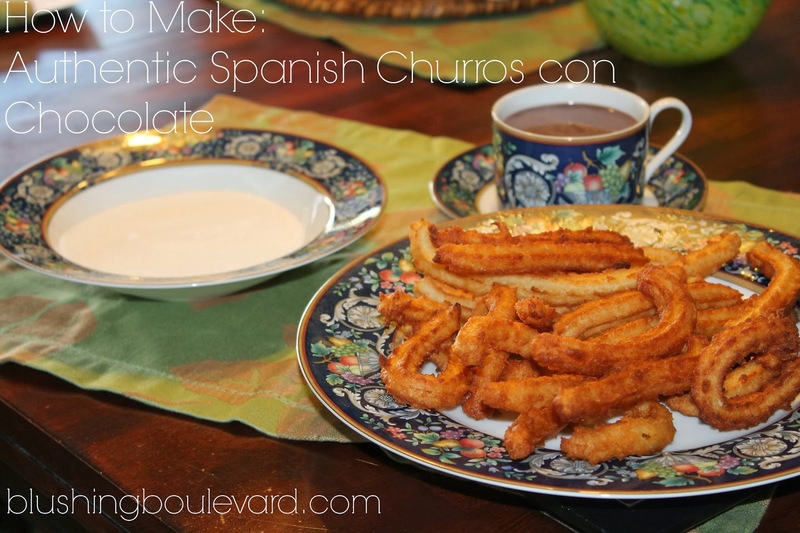 Put the paste into a Churro maker ( You can purchase one online through " La espanola, meats" or " La tienda" these are companies that import products from Spain. Click HERE to purchase one! or HERE! 4. In a pot or deep frying pan add about 2 to 3 cups of olive oil. Heat oil till very hot so that when dropping in the Churro paste it will gradually turn into a nice golden color. 5.Strain churros and place on paper towels to drain extra oil. Make sure not to cook too many churros at one time as this will affect the heat of the oil, resulting in not very crispy churros. 6. Enjoy with a cup of hot Spanish style chocolate. 8. You will follow the instructions on the packaging, by just mixing the appropriate amount of milk over the stove, by adding the chocolate mix first then the milk. If y'all have any questions please email me!! I am more than happy to help y'all out! I hope some of y'all try this recipe out because its just so amazing!! Thanks for reading! That looks delicious! Can you have us over sometime for a churro Saturday? Pretty sure this is going to win me wife of the year.